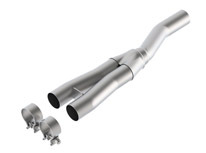 This Y-Pipe option can be used to replace the front muffler in 2.3L and 3.7L Cat-Back systems that have front mufflers or can be used along with Mid-Pipes and Axle-Back systems to create a Cat-Back system. It is not intended to replace the original equipment front muffler. 2015-2019 Mustang 2.3L EcoBoost® Automatic/Manual Trans. Rear Wheel Drive 2 door.